Only a few years ago I had no idea what a Michelin star restaurant was. Growing up, I only knew of Michelin as the giant, bloated, white cartoon advertisement, promoting car tires. I am not sure when I even first became aware of the word Michelin related to fine dining, but it most likely involved an Anthony Bourdain show. So to be dining at an intimate, Italian Michelin Star restaurant, Amerigo Savigno, in Savigno, Italy, the city of truffles, was beyond belief. This is what it is like to dine on truffles at Amerigo 1934. Our trip through Emilia Romagna, Italy, was all about luxury dining – the kind of luxury dining that marries tradition with modern techniques, using fresh local ingredients. When we were planning our trip, we kept hearing Michelin star chef this and Michelin star chef that. I felt a little, well, luxurious, and perhaps an interloper. Me? A lowly old food travel blogger, searching for meals inspired by famous chefs. I did not, though, expect to be dining on white truffles, in a small Italian town, being served by a Michelin star chef, and in the company of another famous American chef. But, that is where we found ourselves, in the tiny little town of Savigno, in the hills of Bologna, at the famous Amerigo dal 1934. Before walking in, I expected something out of a Hollywood blockbuster movie. Something fancy, where I would immediately feel underdressed and out of my league. Not exactly black tie, but Italians dressed to the nines and fancy, pompous servers. But instead, the ristorante Amerigo was down to earth, almost country-house-like. Yeah, the food was served with gold rimmed china on white table cloths, but otherwise it just seemed like a normal neighborhood restaurant, filled with locals, out for some classic Italian fare. There was one difference: our meal focused on truffles. And, not just the regular old black truffle, but the good stuff, the expensive stuff: Italian white truffles. Loads of white truffles. All served by the Michelin star Chef Alberto Bettini and sourced locally, the result of truffle hunts in Emilia Romagna. Now, I am not sure if normally Chef Bettini would have been serving each of our courses and diligently serving our wine, although he did seem to be spending some time at other tables, with his regulars. I think he was paying attention to our table a bit more than others, and it was not because I am a famous food travel blogger. We were set up on a blind dinner date of sorts, where another Yummy Italy client would join us for our white truffle feast. Chef Amy Ferguson from Hawaii, the first female executive chef at a five star hotel, was our white truffle dinner companion. Of course, we did not know this at the time we ate our luxurious truffle meal. To us, she was just Amy from Hawaii. Chef Bettini is a fan of Chef Ferguson, so we got the star treatment for sure. So, we found ourselves in the tiny town of Savigno, at a famous Michelin star restaurant, dining with a famous chef, and luxuriating in a meal loaded with decadent white truffles, all served by another famous chef. This was certainly not what I expected from our trip through Emilia Romagna. Pancotto is a traditional dish in the Emilia Romagna region. Instead of pasta, day old bread was used. It was soaked and layered with béchamel and mushrooms to make a poor man’s lasagna. It was amazing…creamy, earthy and an intense way to start a multi-course meal. Passatelli is a specialty pasta in the region of Emilia Romagna. A dense, rolled pasta, which is slightly doughy, it is textured enough to grab onto the surrounding sauces. In this case, the sauce was light and the dish covered with white truffles. Chef Bettini did not hold back either. I have eaten at restaurants where a white truffle pasta course involves one, maybe two slivers of truffles, but Chef Bettini believes in going all out. You could barely see the pasta under the layers of white truffles. Our second pasta course was a thick and creamy gnocchi, which we helped to make in our pasta cooking class earlier that afternoon. The gnocchi was served with, what else, truffles. Truffles do not necessarily have a unique taste of their own. To me, their intrigue comes from the smell and I started each of these courses with my nose deep in the dish, taking it all in. The truffles do add richness to a dish, even one that is already rich, like a plate of large potato gnocchi. I was starting to fill up already, with three dense and carb loaded courses. I started to wonder how many more courses we would receive. This is one of Amerigo’s specialties, the white truffle egg. Each year Chef Bettini develops a new version of the truffle egg. This one involved beating egg whites and cooking them in an oven, allowing the yolk to stay liquid inside. It created something like an egg white muffin, which was of course covered in white truffles. As a side dish to the truffle egg was another white truffle egg. The second egg was wrapped inside potato and covered with truffles. At this point, Chef Ferguson looked at me across the table, and I looked at her, and we all knew we were done for the night. Four carb heavy courses, three of which were covered in truffles, leaving a decadent odor of earthy truffle dangling over the table. My belly was filled with fantastic local wines, pasta and truffles, and I wanted to cry mercy. I am never one to shy away from food, but even before we dug a fork into the white truffle egg, knew we had one more pasta course to go. As a mere non-chef mortal I was hesitant to inform Chef Bettini that we could not eat another bite, let alone another course of pasta. After all, these were not small servings either. I implored Chef Amy to give notice of our intention to call mercy, a cry from one chef to another, that we could not go any further. There was some disappointment in Chef Bettini’s eyes, as we passed on the tagliatelle al tartufo. We continued with some after dinner grappa, a gelato to aid in digestion, and passed out, literally, across the street. Although we were staying in an agriturismo about a 45 minute drive from Savigno, we actually booked a last minute room at the one hotel in town, across from Amerigo. We knew it would be too late and Eric would be in too much of a food coma to drive home. This was the first time we have ever done this – walked away from a hotel room, and paid for another, due to over eating. I was so glad we did. Dinner started well after 8pm, and did not end until close to 11pm. Three hours of white truffles and traditional Italian food and wine. It was worth it. I would love to return to Amerigo to try a non-truffle related tasting menu, because the Amerigo Savigno menu, outside of truffles, also looks delicisou. The food was very, very good, but I think we may have over done it on the truffles. Before this dinner at Amerigo, I did not think that was possible. Turns out, it is entirely possible. There is such a thing as too many truffles. Chef Bettini, well done sir. Amerigo dal 1934 is located on Via Marconi in Savigno, Emilia Romagna. The restaurant suggests not using your GPS to find them, because it’s wrong! Just call ahead, or look just off of the main square in Savigno for the store front. Open for lunch, only with reservations. They also operate La Dispensa di Amerigo, a food and wine shop specializing in local products. And, Alberto Bettini also operates Locanda Amerigo, a small boutique hotel with a few rooms, just a handful of blocks away from Trattoria Amerigo. Looking for more travel tips on Emilia Romagna, and how to eat the best food in Italy? 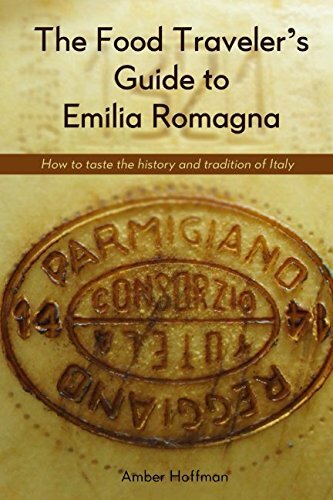 My book The Food Traveler’s Guide to Emilia Romagna: How to taste the history and tradition of Italy , is available on Amazon. If you are a NOOK reader, it is also available for download on Barnes and Noble. Yummy Italy arranged this truffle dinner for us, and they can arrange all sorts of unique gourmet tours through Emilia Romagna. The white truffle dishes at Amerigo are approximately €35, but other, non-truffle dishes can be had for a lot less. For more luxury dining tips and stories, check out our Luxury Travel Guide. And, for more about the food in Emilia Romagna, check out our Emilia Romagna Food Travel Guide. Hey that was an awesome experience! You’re funny, too!!! Right, we were looking for the pasta under that pile of TRUFFLES, yum! Wait for Friday’s post about the cooking class at Amerigo! I’m so glad I read this. My husband and I will be there next week. Sounds like we should eat very light during the day before this experience! Can’t wait! Oh, it’s hard to eat light any day in Emilia Romagna. Enjoy!